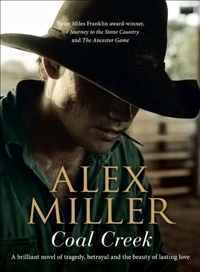 Coal Creek sees Alex Miller, twice a winner of the Miles Franklin Award, return to his ‘stone country’ roots. Set mostly in the aftermath of WWII, it’s the story of Bobby Blue (Blewit), told in a distinctive first person voice that is suffused with the simple yet wise lyricism of the people of the scrub country that comprises the Queensland ranges inland from Townsville. Uneducated, innocent and warm-hearted, Bobby works as a stockman with his father until his father dies (his loving mother having died earlier), at which point Bobby, aged 20, gets a job working as a deputy offsider to Mount Hay’s new policeman, Daniel Collins. Collins is an educated man who served in New Guinea during the war. He has moved up from the coast with his wife Esme and their two girls, Irie and Miriam. He does not understand the people of the ranges, nor its country. He has brought with him books on geology, as if they might offer a way of comprehending this unfamiliar landscape. But its secrets will not come to him that way. When Bobby is out riding with him, Bobby ‘soon seen he never knew he was being watched. I knew from that he was not the man for that country.’ Bobby thinks his father would have taken one look at Collins and walked the other way. Daniel puts the locals offside, and Esme’s ‘high morals’ prove problematic. She has very strong ideas on how Daniel should police, and her suffocating parenting alienates her daughters (they start to go off into the unforgiving scrubs to get away from her). Bobby’s lifelong friend is Ben, a volatile man who lives out by Coal Creek with Deeds, an Aboriginal girl in her mid-teens. Bobby and Ben grew up together, the pair of them going out with their fathers and working for the stockholders in the region. Bobby holds a strong plutonic love for Ben. And “Love is faith. It does you good to have it, but it usually has a price to it.” If it all comes down to it, Bobby knows he will be on Ben’s side. Bobby had a loving and close relationship with his mother, and a deep respect of his father who could always see trouble coming and who didn’t suffer fools. Bobby suffers Daniel and Esme because of his friendship with Irie. Going on thirteen, she teaches Bobby how to read and a strong bond is formed between them, a bond that proves disastrous. He doesn’t see anything untoward in his relationship with her. He says he will wait for her to ‘come into her womanhood’. Not surprisingly, her parents think otherwise, and things spiral out of control for the lot of them as suspicions turn into mistrust and misunderstanding. …them long rolling ridges of scrub, one after the other as far as the eye can see, going on into the haze of the day like a dream till you forget where you are. Just played-out mining and poor scrub country, that is all it is, fit only for them half-wild cattle and that was all the good it ever was. My country. I have no other. Them Old People knows things we whitefellers can never know. They are the dust of them worn-down mountains themselves and the knowledge is in them like the marrow of their souls. Which it will never be in us. One can’t help but feel as though some of that dust has gotten under the skin of Miller too, for the landscape he so lovingly paints seems an inseparable part of him. Coal Creek delves into the nature of friendship amidst competing loyalties; it’s about betrayal and how love endures. It shows us yet again how suspicion breeds misunderstanding. It is a wise hymn to the stone country and the Old People. Winner of the 2014 Victorian Premier’s Prize for Fiction, it is a very satisfying read. Miller will talk about Coal Creek at this year’s Sydney Writers’ Festival, and I’ve already got my ticket. I really must read this, I was expecting it to be long-listed for the MF, it’s the first time in ages that Miller has been overlooked. Do you think it’s the narration that might have put the judges off? (I’ve heard both good and bad reactions to it). Now that’s an interesting thought…. maybe we should get Sue to do a Monday muse on that!